Core Aeration – T&J Landscaping & Snow Removal, Inc.
A Core Aeration and Overseed! Core aeration removes soil plugs out of the lawn, allowing air, water and nutrients to penetrate down into the soil. The goal is to alleviate compaction to improve water and oxygen movement in the soil which will increase rooting. Grass roots growing down in the soil instead of in the thatch, are less susceptible to excessive heat and fluctuations in available moisture. At the same time, the aeration we will spread a perfect blend of Kentucky Blue, Rye, and Fescue that are ideal for Michigan weather. 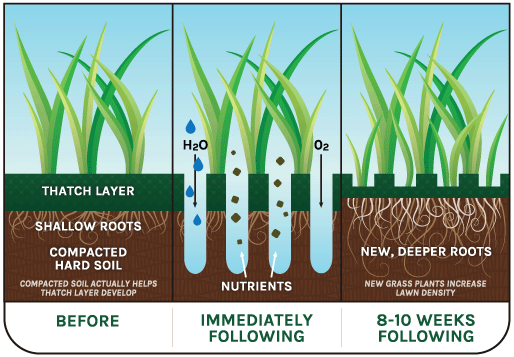 The overseed will introduce new seedlings to your existing lawn and thicken up turf. By thickening the turf, it will help choke out weeds and other wild grasses.